Driverless cars will happen, eventually. But when they do, who knows what they will be like, or look like, what they will do or not do, what other changes they will precipitate? When this finally happens, it will surely be the railways, or the internet, in the sense that it will be big, and that nobody now knows how big or what the details will consist of. Two driverless vehicle articles came to my attention today, both of which illustrate how very different driverless vehicles could end up being to the vehicles we are now familiar with. 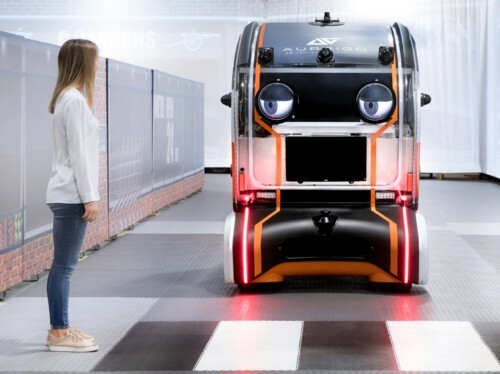 This Dezeen report reports on a scheme by Land Rover to put eyes on the front of driverless vehicles, to communicate with pedestrians, the way pedestrians now look at the faces of drivers to negotiate who goes where, when. Makes sense. With no driver, and the vehicle driving itself, it could use a face, or else how will the vehicle be able to participate in after-you-no-after-you-no-afteryou-no-I-insist-so-do-I sessions? So, does a robot with a working face (in due course robot faces will be a lot better than that one) count as: “Other creatures”? I say: yes (see below). Will the Thomas the Tank Engine books prove to be a prophetic glimpse into the future of transport? Eat your hearts out, SF movies. Didn’t see that coming, did you? And here is a posting about how people might choose to sleep in driverless vehicles on long journeys, instead of going by air. The problem with going by air being that you have to go by airport, and that sleeping in the typical airplane is for many impossibly uncomfortable. But, if we do sleep on long distance driverless vehicles, what will we do about going to the toilet? Stop at a toilet sounds like an answer. But what will the toilet be like? Might it also be a vehicle? The point is: nobody knows how driverless vehicles will play out. Except to say that if they look like cars and vans and lorries look now, that would be an insanely improbable coincidence. LATER: More about those eyes here.